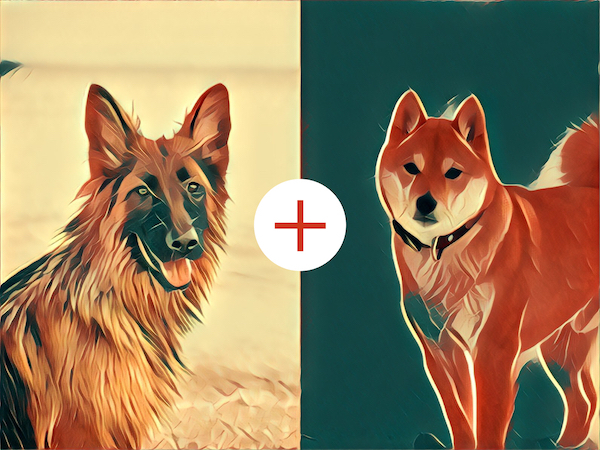 When you combine the bold, fearless nature of the German Shepherd with the silent, independent nature of the Shiba Inu—you get, a prestigious designer breed known as the Shiba Inu German Shepherd Mix. 5 Fun Facts You Need To Know About the Shiba Inu German Shepherd Cross! 1. Prepare those vacuums! The Shiba Inu German Shepherd cross is going to shed a lot—Thanks to his Shepherd fur! 2. Shiba Inus can live anywhere between 12 to 15 years. While German Shepherds can live up to 10 years! This means that your hybrid can live between 7 to 15 years if well-cared for! 3. They’re an active, energetic cross! Couch potatoes be warned! These hybrids are full of energy and will require a minimum of 75 minutes of daily exercise. 4. They can make great watch- and guard dogs! Because of their German Shepherd ancestry, these pups can get very protective of their family. 5. The Shiba German Shepherd cross is, fortunately, a relatively quiet breed! They only bark when necessary. According to the American Kennel Club, the Shiba Inu is a medium-sized dog who can stand between 14 to 17 inches in height. Conversely, the German Shepherd is considered a large-sized dog who stands between 22 to 26 inches in height. This means that your Shiba Shepherd cross can reach heights up to 22+ inches, particularly if they inherit more German Shepherd features. At first glance, people are often taken by this breeds mesmerizing look. The Shiba Inu German Shepherd mix tends to inherit that “fox-faced” appearance from the Shiba Inu. These crosses retain a very, long slender look which is a characteristic trait of the German Shepherd. The eyes of this designer breed are dark brown, medium-almond shaped eyes. Their ears tend to be set up high, and are erect! This is a feature seen in both the Shiba and German Shepherd. Their body is long, muscular, and compact. The Shiba Inu German Shepherd mix will have medium to long length coats. Their fur is dense and double coated, which means they’ll be resilient to cold weathering. The Shiba Inu German Shepherd cross is truly a spectacular breed. These are the type of crosses who are incredibly intelligent and vigilant. These hybrids can make great family pets but do particularly well with older children. Because of their Shiba and German Shepherd ancestry, these crosses can have a high prey drive. This means that some dogs may have the tenancy to chase or hunt small animals. In order to prevent this, make sure you socialize your pooch while they’re still puppies. Ethical Considerations—Is This A Healthy Breed? Shiba Inus are indeed considered a fairly healthy dog breed as their most common health concern is hip-dysplasia. However, we all know about the German Shepherds! Given the fact that German Shepherds are not considered healthy breeds. It’s important to consider the ethics behind breeding a fairly unhealthy dog breed with a dog that does have good healthy genetics. While it is debatable to suggest that a hybrid cross of two dog breeds implies that a cross is healthier. It still does not mean your Shiba Inu Shepherd cross is going to fit as a fiddle! Do you have a Shiba Inu German Shepherd Mix? We’d love to see some pictures in the comments below! Have a Shiba-Shep who is 6 months old. He’s cream colored and OH SO FUNNY!! !